Bang & Olufsen launches first BeoVision Smart TV | What Hi-Fi? 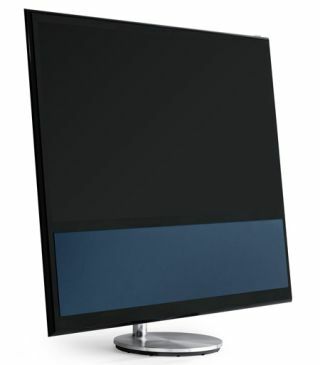 Bang & Olufsen has announced its latest TV, the BeoVision 11, which represents the company's first foray in to Smart TV. Building upon the BeoVision 10, the 11 retains the previous model’s looks but with an upgrade to the technology inside. The BeoVision 11 has a revamped sound system with a custom-made ¾in tweeter, 2in midrange, and a 4in bass driver in each speaker. On the picture side the screen is a 200Hz LED screen, with six HDMI inputs and the option of an internal hard disk for recording. The TV can get online via a wired or wireless connection and gives you access to a selection of apps such as YouTube, Facebook and Twitter. The cabinet even allows you to fit an Apple TV box inside. Also arriving with the 11 is support for Hybrid broadband TV (HbbTV) a new Pan-European standard that includes catch-up TV, gaming and more. The BeoVision 11 is DLNA certified allowing you to access content from other media devices, allowing you to stream music from a smart phone or watch a film stored on a NAS drive. There's a BeoRemote app for controlling the TV using an Android or Apple device, too. BeoVision 11 is available in 40in, 46in and 55in sizes, with a choice of six front fabric colours, a front frame in silver or black, and rear cabinet in black or white. On sale exclusively at Bang & Olufsen stores from 11 October 2012: prices start at £4,995.